As I fought through Wal-Mart this morning, to finish (that’s right, I said finish) my Christmas shopping, I saw a small child with her mother talking excitedly in the toy department. It was wall to wall people. But, you could hear this child talking excitedly about Christmas over the deafening din of people. She was looking at every doll that was on display. She wanted them all. It made me think back to when I was about that age (I was guess she was about 8 or 9). I still believed in Santa Claus until I was 9 years old. After I overheard relatives asking my mother if I still believed in Santa Claus, I went into the backyard and cried for the rest of the day. Christmas was never the same after that, of course. The magic of Christmas was gone. I remember my sister waking me up at 2AM Christmas morning, when I was about 10 years old, to go see if Santa had come yet. I wasn’t about to tell her there was no Santa. When we went into the living room, it was like magic. My red Murray Racer bicycle was there right in front of the Christmas tree. Even though I knew there was no Santa, I was still thrilled beyond words. My sister was screaming about her dolls and other toys she had gotten from Santa. My brother was upset as usual because he didn’t get exactly what he wanted. In fact, he was usually mad on Christmas morning. I remember when we were in school, I would count down the days until Christmas vacation would start. That was like a double Christmas gift to me since I hated school so much. I remember grandma coming over with all kinds of candy, pies and cakes for us to eat after we started our Christmas vacation. It was something of a tradition for grandma. One of the most exciting things was when we would go to the tree lots to pick out a Christmas tree. We wanted to bring home every tree in the lot and decorate it. Decorating the Christmas tree was a labor of love. Taking it down was always one of the saddest tasks we had as children. We never wanted Christmas to end. 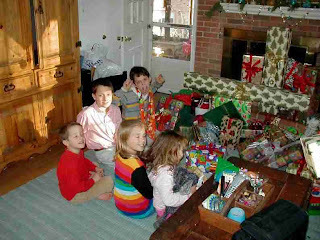 The biggest event (beside the Christmas morning wakeup call) for us on Christmas was when we would go to grandma’s house and get even more gifts from the many relatives. My father had two brothers and four sisters. So, we got more gifts than we could take home sometimes at this big Christmas dinner at grandma’s house. One year, I got two Daisy BB guns. I refused to give one to my always malcontent brother. Dinner was always anticlimactic to me. It was getting the gifts that made things for us. Of course, grandma would always remind of us the real reason for the season; the birth of Jesus Christ. It didn’t quite sink in what she was getting at since I was so overwhelmed with the many gifts. But, at long last, it does sink in now. I’m make some more posts about reminisces of Christmas in the coming days and weeks. What a great post! I remember some of the same things about Christmas as a child that you mentioned. I don't remember when I stopped believing in Santa though. My hubby had a similar experience as you. He was crushed when he found this out and very angry that his parents had lied to him for all of those years. Because of that, we have never tried to make our children believe in Santa. Instead, we emphasize Saint Nicholas and his contribution to children and most of all, our Lord and Savior Jesus Christ. And I agree with you...finally now, for me, it is sinking in! that's nice to have good christmas memories ... what a great time for families and friends!